I wrote this poem in celebration of the Endeavor Shuttle mission of Mae Jemison, the first woman of color in space. 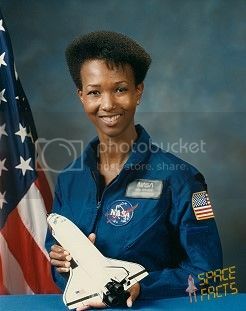 This poem is written from the point of view of Mae Jemison, and it merges the factual with my own poetic imagination. This poem is the first in a series of poems about famous Americans aimed at middle grades students. My blood pumps itself to a distant planet. My brain is a supernova. My skin is a million stars. The orange straps across my suit are bright as a fire. bubbling on the stove, the smell of biscuits and bacon. in the swing, our feet rising across the pumpkin moon. separate but equal. My school teacher mama wanted more. to spirit, to hope, to zeal, to inspiration. an Alabama child with the whole world in her hands. I recently performed this poem for the students, teachers, and parents at the Poetry Out Loud Regional Competition in Spartanburg, SC at Spartanburg Community College. Sponsored by Hub City. *Mae Jemison was not interviewed in regards to this poem, so the details of what she may have been thinking about while she waited to launch into space are wholly from my imagination.